Most skiers who think of the top destinations in the United States focus on Colorado, and for good reason. The state offers plenty of slopes for skiers of all skill levels, and the Rocky Mountains are the perfect environment for every ski bunny or aspiring Olympian. Of course, the Rockies aren’t the only mountains in the country, and other states offer excellent ski destinations, too. Consider the six on this list, which are sure to be a hit. More than 150 years old, this mountain town is the perfect getaway for any outdoor lover. 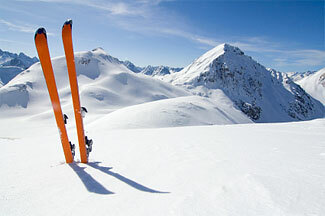 Various types of skiing are available during the months of winter and spring, which makes it fun for the whole family. Of course, Breckenridge doesn’t shut down in the summertime. The town continues to offer activities such as river rafting, golfing, horseback riding and rides in hot air balloons. Forget about the horror movie of the same name. Lake Placid is actually home to Whiteface Ski Resort, one of Ski Magazine’s top-rated resorts on the East Coast. Whiteface is less hurried than the resorts in Vermont, because fewer skiers know about it. However, this is not because it is any less worthy. This resort has hosted the Winter Olympics twice in the past 100 years, and bobsled and toboggan rides aren’t far away, either. The great outdoors is home to moose and skiers. The Anchorage area has received high reviews for its skiing accommodations as well as a general vacation site. Anchorage not only offers the snow-covered hills and trails for cross-country skiing, but it’s one of the few places in the country that offers the breathtaking site of the Aurora Borealis. Three different alpine ski locations exist within forty-five minutes of downtown, including Alyeska Resort and Arctic Valley ski area. When you think of Utah, you might think of the Mormons in Salt Lake City or even potatoes. However, those are only two of the offerings of the state. Sundance, in particular, is home to a ski resort that actor Robert Redford owns. Sundance Ski Resort has an unmistakable appearance due to its natural woods, hand-crafted furniture and features made of local stone. Sundance is all about the old-fashioned charm that some resorts have foregone to appeal to the masses. Cozy cottages keep you warm until you are ready to hit the slopes on skis or snowboards. Instructors offer snow shoe courses for anyone wanting to learn how they are used, as well. Heavenly Valley Ski Resort boasts the largest snow-making machines in the region, and that’s not all that Lake Tahoe offers to avid skiers. The resort offers condos for guests, who can then hop down to Tahoe itself and partake in a little gambling. Aside from skiing, visitors can enjoy snowmobiling, sleigh rides in the winter and the region’s natural hot springs. Heavenly Valley Ski Resort has the advantage over the competition, because its height offers a long season. Skiers can hit the slopes between November and May. The snow-capped mountain is the perfect location for a winter picnic, too. Vail is known as the number-one ski destination in the country, and you won’t read a list that doesn’t mention this town. The official Vail Ski Resort has been open since 1988 and is the largest in the country. The resort provides activities on Vail Mountain. This gigantic resort includes 33 ski lifts with nearly 200 different ski trails. Lovers of the cold can experience exhilarating activity in single-digit temperatures during the colder months of the year. To relax, enthusiasts can stop by the town’s ski museum, too. This has been a guest posting by the Breckenridge resort managers in Breckenridge, CO. If you want to go all out and take a tribe of people to the beach for your next vacation, check out this luxury Santa Rosa Beach Vacation rental along Highway 30A named Just Beachy House, that features 4 bedrooms, 5, yes count them, 5 bathrooms and can sleep up to 14 people. I’m not quite sure how you stuff 14 people in a 4 bedroom house, but that’s how many people they claim can sleep here. This home has a great location right within walking distance to the beach and features a private pool along with all its other amenities. You also get a nice view of the Gulf of Mexico from the top floor. And of course, there is free wireless internet access throughout the entire home if you must bring you computer and work while you are on vacation. Well okay, you might want to look up a restaurant or two while you are on vacation here in the panhandle of Florida, but don’t over do it. Private pool with jacuzzi, heating optional,( off season for $250 week). This 4 bedroom, 3 full bath and & 2 half bath house located in beautiful Old Florida Beach is sure to become a vacation favorite for those groups that want to vacation in style. Sleeps 14–1king, 1 queen, 2 twins, 2 sets of twin bunks, 2 queen sofa sleepers. 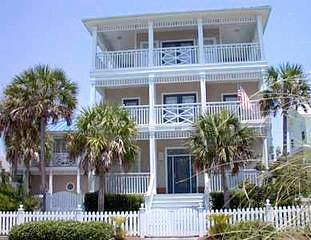 Beautifully decorated, this home features awesome views of the gulf from the second and third story balconies. You can sip on a morning cup of coffee and watch the sun come up or have a drink and watch the sunset from the same location. For your convenience, a computer desktop workstation is provided for internet access during your visit. The third floor consists of the master suite and large master bath. The second floor has two bedrooms and a bunk room for the kids. The entry level has two queen sleeper sofas and a fantastic entertainment system for all to enjoy. A fireplace also adds to the ambiance of this level. This home in Santa Rosa Beach rents for $2,485 per night but, if you contact the owner you can get more specific rates and may be able to get a better rate or negotiate some on your terms. Another Gatlinburg cabin rental we located is the 3 bedroom “All Laid Back” cabin located in the Smoky Mountains resort of Black Bear Falls Resort. The rental is located less than 3 minutes from the Downtown area of Gatlinburg with all of its great shopping, restaurants and of course fun that never ends. The All Laid Back cabin has 3 bedrooms and it can sleep up to 8 people in its 1,750 square feet of living space. And it rents for only $165 to $230 per night. Not bad for a place that you can bring your whole family to and enjoy a week or longer vacation in the Smoky Mountains. Get “All Laid Back” in this awesome, 3 Bedroom, 3 Bathroom cabin located in the beautiful Black Bear Falls Resort community of Gatlinburg. Located in Gatiinburg’s city limits and less than 3 miles to downtown and the entrance to the Great Smoky Mountain National Park and only a short drive to Pigeon Forge. Soak your worries away in our hot tub located on the deck or warm your bones by the fireplace in our great room. In the Summer months take a short stroll to the resort’s swimming pool (located within walking distance from our cabin). Challenge your family and friends to a game on the pool table located on the lower level of the cabin. All the bedrooms have Kingsized beds and full bathrooms attached. Plus, they are all located on different levels of the cabin which allows for extra privacy! The pull-out sofa is located on the lower level in the game room. 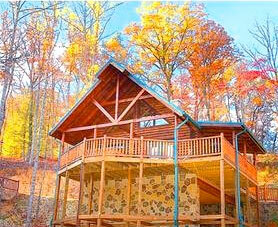 You can get more information on this beautiful Gatlinburg cabin rental here. Make sure you email the owner to get the best rates available. Over the years my wife and I have been to the Pigeon Forge and Gatlinburg Tennessee area 4 times and that’s not counting the times I visited before we were married. There’s just something about the Smokey Mountains that draws you in and that intangible thing is what drives us there are many other from around the world. A true log cabin, this beautiful two bedroom luxury cabin offers king size beds, indoor jacuzzi tub and a hot tub on the deck. Play a game of pool or just relax next to the cozy fireplace, this cabin is sure to create memories forever. Enter on the main level into the great room where there is 20 feet of glass overlooking the wooded valley. With comfortable seating for 5, you can enjoy the fireplace or go up to the loft and play a game of pool. The full kitchen and dining room adjoin the great room where there is seating for 6 including the breakfast bar. A washer / dryer is included for your convenience. How does that sound for a nice vacation rental in the Smokies? And when you add some of these amenities below you have the perfect vacation getaway in the mountains. And lots, lots more. 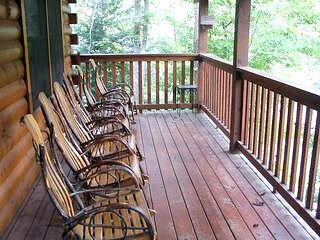 Check out this Gatlinburg cabin rental here and start planing you vacation today. Last October of 2011 we ended our month long vacation in the Southwestern United States by staying a week in the Florida panhandle. 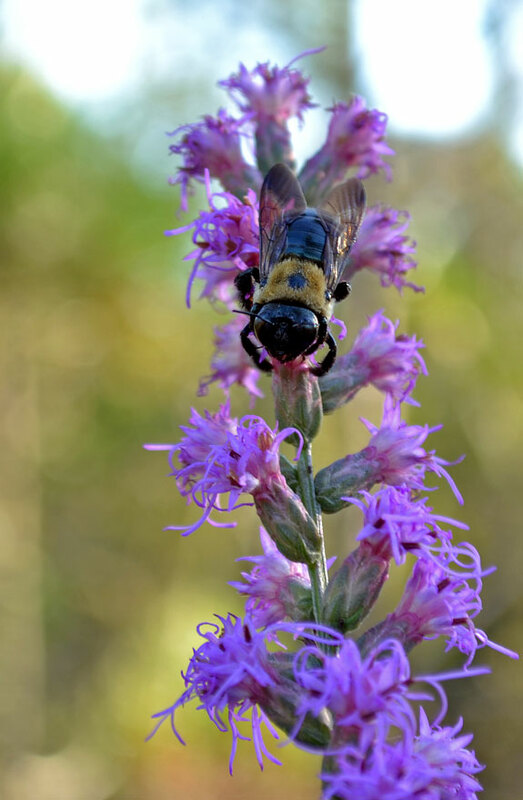 During that stay we ventured into Topsail Hill Preserve State Park and just by providence happened across a beautiful field of blooming Liatris with butterflies, moths and bees doing their pollinating thing. 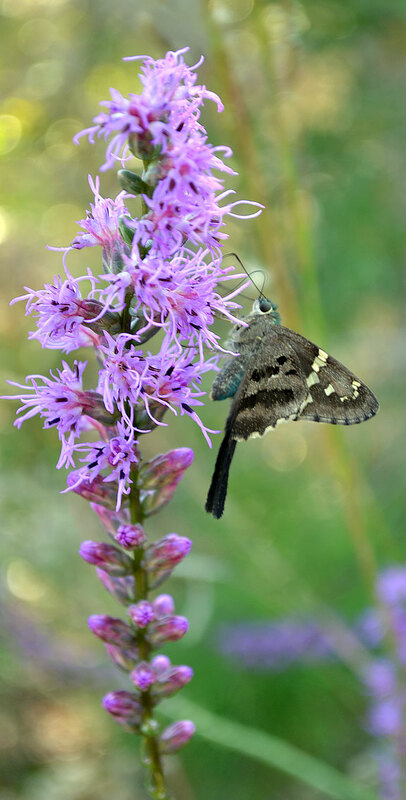 In fact there were hundreds of these fluttering creatures darting in and around the Liatris and in some cases there were as many as 5 or 6 that were pollinating a single flower at the same time. 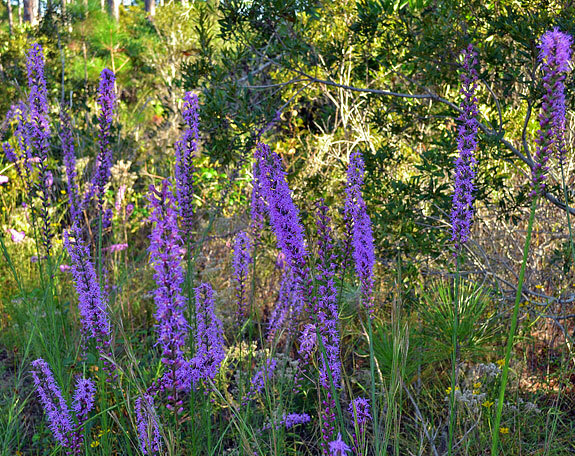 This was just at the entrance of Topsail Hill Preserve State Park right down from our vacation rental in Dune Allen Beach and we must have stayed there (in the no parking zone by the way) for probably 45 minutes to an hour just observing and photographing the flowers, butterflies and bees. I ended up taking a few hundred pictures during that hour or so and have hopefully the best posted here. Apparently the end of October is the best time to catch this pollinating crowd of creatures do there thing. If you ever get the chance to vacation in Ft Walton County along the beaches of 30A, stop in Topsail Hill Preserve State Park right at the little pond at the entrance and enjoy the show. In the mean time enjoy the pictures here.